Shadowrun is a PC game in the FPS genre. The game was published by Microsoft Game Studios and developed by FASA Interactive. The game has an ESRB Rating of M (Mature 17+) and was released on 2007-05-29. 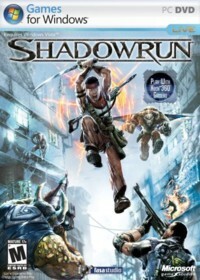 The game's official site can be found at www.microsoft.com/games/pc/shadowrun.aspx. Just like the box says - "Rewrite the Rules of Engagement"
Shadowrun is a first-person shooter based around the Shadowrun mythos which began over three decades ago with a tabletop role playing game and later in several video games during the 16-bit era. The game was hammered pretty hard by critics, but I found it to be one of the best first person shooters I have played in recent memory. The first thing to note is that the game is entirely multiplayer (except of course for the training levels where you learn the basic controls for the game), so if you are looking for a deep single player experience with an amazing story you may as well look elsewhere. However, you will be missing out on one of the best, most well-balanced mulitplayer games ever. The game has four main races, each with different abilities. The "trolls" are slow but are the most powerful. Its special ability is hardening its thick skin to absorb tremendous amounts of damage. The "dwarves" are slightly faster than the trolls but lack their defensive abilities. Instead, dwarves are magic users that can summon beasts to guard areas or to attack enemies. The "elves" are the fastest race in the game by far, but at the same time they are also the weakest. Their special ability is self healing. Finally, there are the "humans", they have the second highest defense and the second highest speed (i.e. they are more or less good all around characters). Their special ability is being able to have full essence (which are the points consumed when performing special abilities - which i will get to in a bit) regardless of weapons and tech and they also get bonus money at the start of each round. In addition, each race is hampered differently depending on the weapons/items/tech they have equipped. Players earn money throughout each round that they can spend on various items such as magic, equipment, and weapons between rounds. Example spells include resurrecting teammates and wind spells. Example tech includes the use of grenades and gliding across gaps. Finally, example weapons include FPS mainstays such as the SMG and shotgun and even more outlandish weapons such as a katana. Each time you cast a spell or use a technology you use up "essence", which regenerates over time. The online consists of three main modes - Attrition which is sort of like team deathmatch, Raid which is where one team defends a flag while the other tries to capture it, and Extraction which is the standard capture the flag mode. Two negatives are the small number of game modes and the small number of maps (there are only 9). However, the maps are really well designed and I never got bored playing them. This was the first game that allowed PC players to play against Xbox 360 players, supposedly ending the mouse+keyboard vs. joystick debate once and for all. I have played friends on both platforms and the developers did a really great job balancing this game. Overall, I found PC players didn't have any real advantage at all. Overall, any fan of first person shooters owes it to themselves to try out this game. It can be found for extremely cheap nowadays as its several years old. The fact that the online community is still so active is a testament to how well the developers put together the game. I still play it to this day (as a dwarf :) ).